I think, if I am not mistaken, I have already told you that there's no right and wrong formula to cooking? For the food we cook at home? Basically, its pretty much up to us, though we like to gather some ideas on food cooking from tv programs and of course, these days, we shouldn't discount online search (Nyonya Lam Mee, Hakka Noodles, Chow Mein & Fried Mee Hoon). Let's forget about tv programs for the time being and speak about online recipe sharing. Oh my god. Millions of recipes will pop up, wouldn't you agree? Definitely (Chinese Vegetarian Noodle Soup, Char Kway Teow, Curry Chicken Noodles & Penang Assam Laksa). These recipes of course without a doubt are a guide to our cooking or for some of you, you like to follow exactly. Then again, basically its up to you and your choice. However or whatever, for me personally, even when I share my own recipes, I like to make it a point in telling all of you that if you feel you can substitute the ingredients because you feel you already have other ingredients which are equally good, go ahead. Use them instead buying just to replicate recipes. For this Chinese Chicken Noodle Soup, I didn't have to refer to recipes because I quite know how to make Chinese noodle dishes (Bee Hoon Soup, Penang Mee Yoke & Sour Spicy Fish Broth Noodle Soup) and what can be different with the ingredients, you tell me (Chinese Chicken Meatball Soup, Chinese Chicken Herbal Soup & Burdock Root Soup)? This Chinese Chicken Noodle Soup I must say is mine. In other words, I did it my way considering ingredients availability. Chinese Chicken Noodle Soup I must stress is a delight. A true delight for tummy delightfulness and make sure you tuck in alongside some sliced chillies soaked in soy sauce and lime juice. Mix chicken with the ingredients listed under "for the chicken"except oil. Heat oil and fry shallots till crispy and dark brown in colour. In the same oil/pan, pour chicken stock. Assemble noodles with crispy fried chicken, fried shallots, bean sprouts and spring onion. Pour soup over and serve immediately. 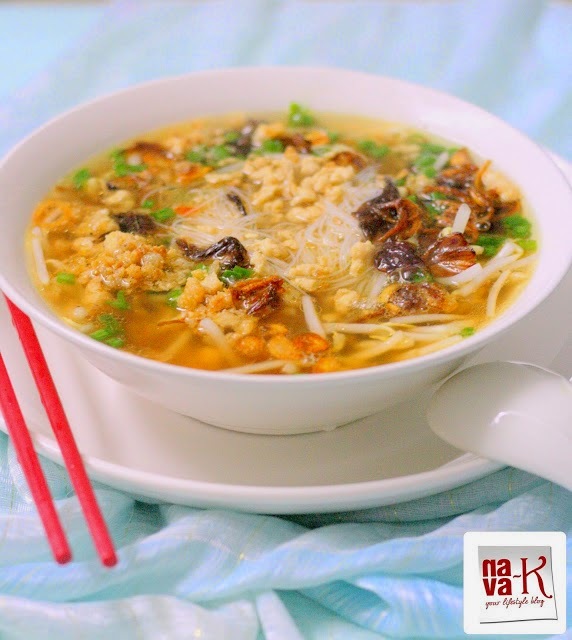 i too had all these experiences Nava.you are right, we need to safe guard our hard work.Loved the addition of bean sprouts to this soup,looks absolutely warming.nice clicks. have a nice weekend dear! Yes, the spam is horrible sometimes. I also received random comments , all of them stated in the same way that they like my blog (it was always very indirect) and then they posted a link to their website. To everyone - NEVER click those links! Delete those comments! Thanks for supporting what I have written. It was horrible. I noticed some of the bloggers actually published the comments, maybe they are not aware of the consequences. Thought of letting them know via this recipe. I'm glad you brought this up. It's a good thing to know for new bloggers, particularly. The soup looks wonderful! That would be delicious and filling too! Hope you have a great weekend! Thanks for letting us know about the verification code. Def. in the interest of our blog. I think you are right to save your blog is more important. Nava I m too facing this situation.too many spammers. And few comments got published automatically & had to delete manually . I m not much techno savvy . Got worried if my account got hacked. Anyways the chicken soup tat i see here is just awesome and mouthwatering. You have got perfect hands for clicking a mouth watering shot. I also read a while ago that spammers may be able to obtain your passwords because there are softwares to do so. Also,change your password from time to time as another security measure. 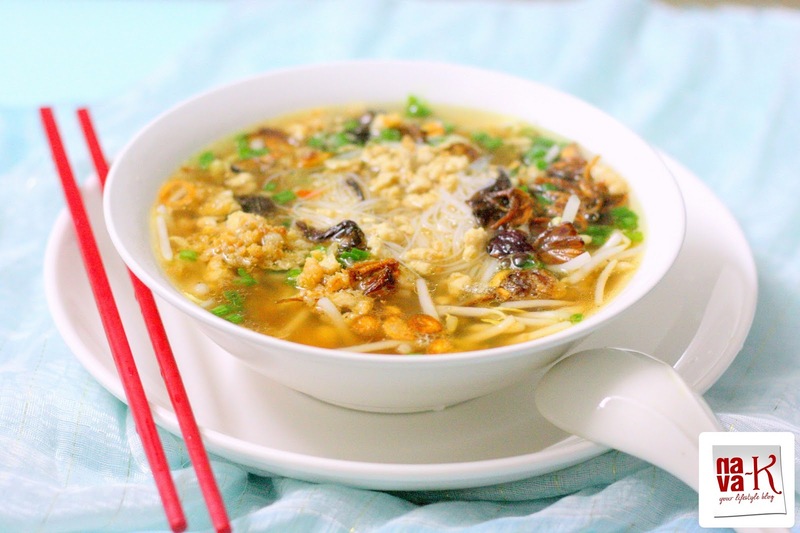 The chicken mee hoon soup is my type of comfort food! Homely full of warmth! Oh luckily i never had this problem but sure something to keep an eye on, thanks for sharing. No worries! Word verification or not, I am still happily visiting your blog for my dosage of good recipes, travel & beauty reviews. I like such mee hoon soups! My type of comfort food! I moderate any post before it gets published. Yes word verification is not choice. Still you have to protect your blog. This chicken soup looks delicious. oo what a gorgeous bowl of soup. i would die for a bowl of noodles right now! and sorry about the blogging setback :p spammers are the worst! glad you're carrying on! that's enticing and so simple to prepare...looks delicious! Thanks for sharing the info about online security dear. Yes it's true that we have to be very careful about our personal info's. as u said it is important to reset our passwords to time to time and make sure u have made the password with at least with 2 letters, 2 numerics and with 2 extra characters such as !@#$*. It will be very difficult for the hackers to crack the password. About the recipe.. I started to like mee hoon after coming to Singapore, but i have never tried on my own. I will try this recipe dear. I hadn't taken the word verification stuff very seriously...thanks for this post ...wonderful soup...would be great on a cold day ! ooo no wonder now the word verification is on. It is very thoughtful of you to share your experience, at the same time educating the readers about the security measures. Appreciate it, Nava! Also I love the bowl of soup, rich flavor and amazing color! Soy sauce is a good addition along with the sparkling red chilli! Wow... I am so sorry you get so much spam! I get a lot too, it really is a pain! Amazing pics and inviting recipe..
Today its such a gloomy rainy day this bowl of soup will be perfect comfort.